Next to being a bridge to our partner manufacturers our aim is to go further. We take a lead in the areas of tank container product development and we offer solutions for market changes. By a way of our innovative light weight tank containers made of composite branded as “Tankwell”, we enable our customers to answer to corporate social responsibility. These tank containers have a conventional steel frame however the inner vessel, traditionally of stainless steel, is replaced by composite material. This type of tank container offers a significant saving in tare weight and greatly improved insulation properties when compared to the stainless steel alternative. The tare weight of the vessel + frame is 25% to 40% lighter than conventional stainless steel tank with the same specification. This means simply that more product can be transported. Simultaneously composite has a 40% better insulation properties due to the decreased heat conductivity of the product. Therefore, the need for additional heating during transport or re-heating of the product before the liquid will be unloaded with the customer delivery can be reduced considerably. Both benefits contribute to less logistic operations which contribute to a positive impact on the environment and a reduction in CO2 emission. 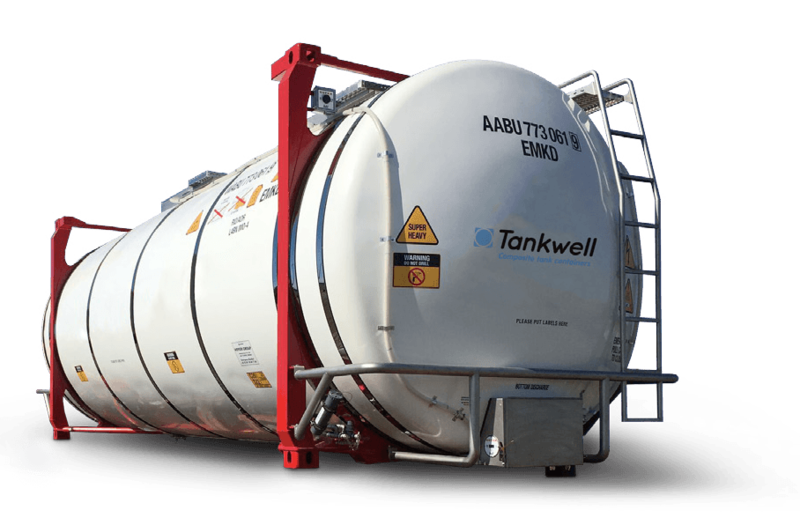 Overview – where does a Tankwell tank container consist of? Stainless steel (Fort Vale) bottom discharge.